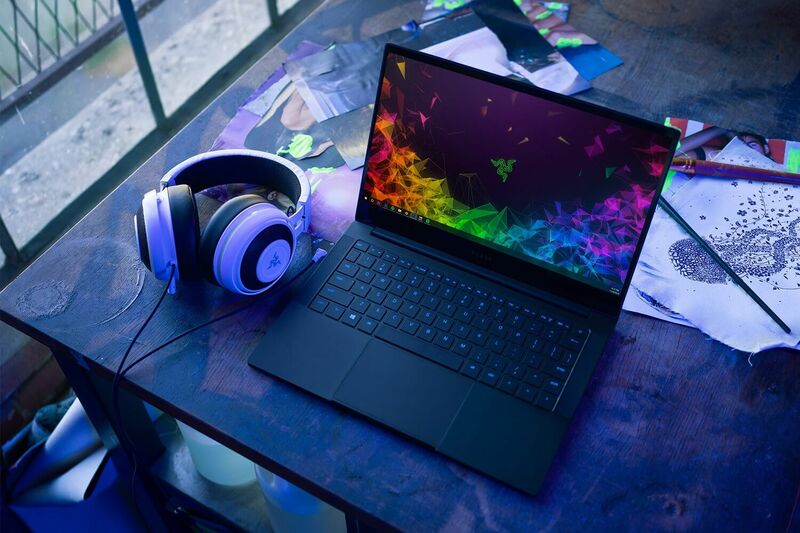 Razer has refreshed its ultra-portable 13-inch Razer Blade Stealth laptop with an updated new look and improved hardware. We'll get into the hardware in a minute, but first, we'll discuss the overall design improvements. The newest version of the Blade Stealth features 60% thinner bezels, as well as harder edges than its predecessor. Additionally, the previous Blade Stealth's glowing green back logo has been scrapped in favor of a more work-friendly black Razer snake outline. The new Blade Stealth also features a larger touchpad, which emphasizes the device's role as a work and productivity-oriented laptop as opposed to a gaming-focused behemoth. Speaking of gaming, though the Stealth is not being marketed as a laptop that can achieve the highest frame rates in the latest titles, it can still hold its own courtesy of a few hardware upgrades. These upgrades include a new Intel Core i7-8565U clocked at 1.8GHz (boostable to 4GHz), and most importantly, a 25-watt Nvidia GeForce MX150 mobile GPU. According to Razer, these refreshed components should allow for up to a "4X performance increase in gaming and content creation," though we have not yet verified that claim for ourselves. Would-be Blade Stealth owners can select from a few different device models: the Base, Graphics and Graphics 4K. All three models, barring the Base will ship with roughly the same hardware. Other than the Base model's downgraded GPU (it swaps out the MX150 for an Intel UHD 620), the only notable differences between the three are their screens and storage drives. The Base has a 256GB SATA HDD and a 1080p display, the Graphics 4K model has a 4K screen with a 512GB PCIe SSD, while the standard Graphics model sits in the middle with a 1080p screen resolution and a 256GB PCIe SSD. Each device's screen appears to be 60Hz, and they all feature "100% sRGB." So, how much are all of these improvements going to cost you? The Base Razer Blade Stealth is $1,400, the Graphics model will cost about $1,600, and the Graphics 4K alternative is priced at $1,900. All three can be purchased directly from Razer's website.